Cosy Sheridan has been called "one of the era's finest and most thoughtful singer/songwriters." A storyteller as well as a songwriter, she weaves children's fables into tales of modern adulthood. Her modern renditions of mythology (meet Hades The Biker) have won her fans and praise from the press. The Cornell Folksong Society wrote, "Sheridan is frank, feisty, sublimely and devilishly funny. She fuses myth with modern culture, Persephone with Botox." She first appeared on the national folk scene in 1992 when she won the songwriting contests at The Kerrville Folk Festival and The Telluride Bluegrass Festival. Since then she's released 8 CDs, written a one-woman show entitled The Pomegranate Seed - An Exploration of Appetite, Body-Image and Myth in Modern Culture. 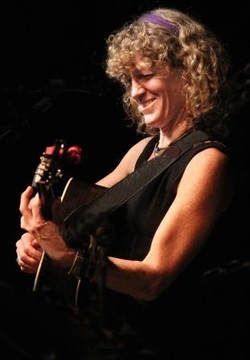 She has taught songwriting, guitar, and performance at music camps across the country for the past 15 years, including The Puget Sound Guitar Workshop, The Swannanoa Gathering, California Coast Music Camp, and Fishtrap.